I’m constantly struck by the high technical quality of old commercial photographs. This image from 1917 is so sharp and clear it could be an advertisement for tailoring or wool manufacturing, “never mind the quality, feel the width.” In that era the combination of technical prowess, quality materials and the market for records of individualism made it a golden age of the studio portrait. This one shows a bright and ambitious young American man, professional and eager for assignment. The informal desktop pose, hands in pocket, suggests readiness and practicality; the clear penetrating gaze, capability for the job in hand. He’s a Protestant citizen with a promising future. The image comes from the website www.shorpy.com which publishes archival vintage photographs of general interest. 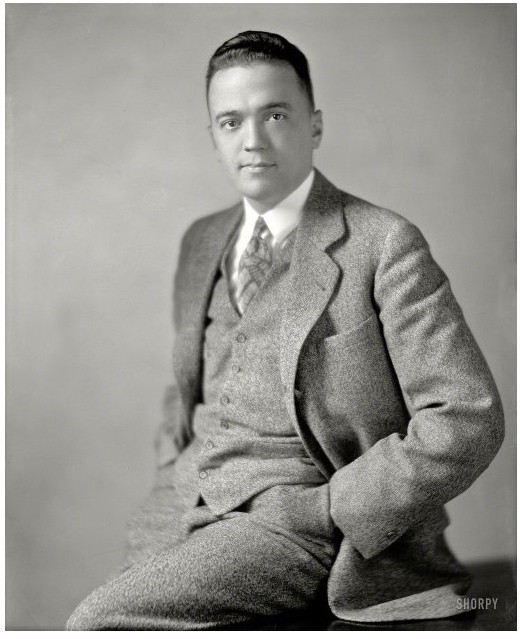 This one is of interest, it shows a young man at the start of his famous career: J. Edgar Hoover, future head of the FBI.